Possible Physical Evidence of Atlantis. Piri Reis Map. Piri Reis Map? Discovery near Cuba? Scott Stones? 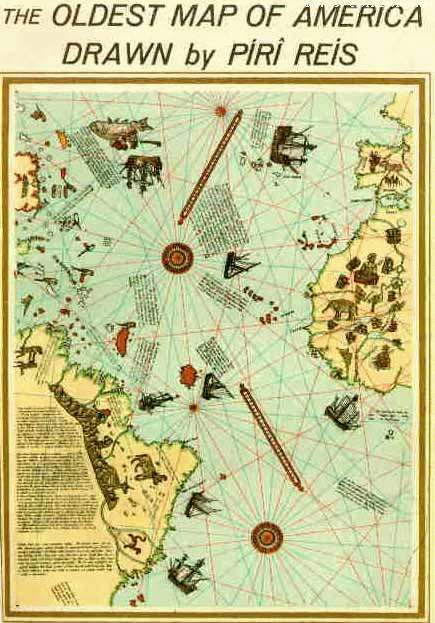 The Piri Reis Map of 1513 is the first surviving map that shows the Americas (the Vinland map may be older but only shows a part of North America). The Piri Reis map shows North America, South America, Greenland and Antarctica which had not yet been discovered. Piri Reis was a famous admiral of the Turkish fleet in the sixteenth century. His passion was cartography, he was always on the lookout for new maps and other such documents. In 1513 a map had been commissioned him. Piri Reis was high rank within the Turkish navy which allowed him to have a privileged access to the Imperial Library of Constantinople. He was considered an expert on Mediterranean lands and coastlines, and he even wrote a famous sailing book called Kitabi Bahriye where he described all the details of coastlines, harbors, currents, shallows, bays and straits of the Mediterranean and Aegean seas. He died in 1554 or 1555 being beheaded for unknown reasons. It is said that in a now-forgotten sea battle he met, among the prisoners, a sailor who claimed to have been sailing along with Columbus in his three journeys to the new world, and that he was one of his pilots. It turned out that Columbus had a map of the lands he was chasing, and that this map now was in the possession of that pilot. The admiral Piri Reis got to put hands and eyes on the map; then in 1513 he compiled a world map based on that map and on the other antique charts from his collection - many of which had survived from the days of the Great Library of Alexandria. The map had drawn the attention of scholars in 1929 when it had been discovered in the archives of the Imperial Palace in Constantinople. The map showed the outline of South America very accurately. This was surprising since Columbus had discovered the New World only 21 years earlier in 1492. Notes made by Piri indicated he had based his map on earlier maps, including one consulted by Columbus before his famous voyage. This excited the scholars since there had been rumors that there existed a pre-Columbian map of the New World. Piri's claim that he had possessed the "lost map" intrigued historians. It wasn't the accuracy of the South American coastline that interested Mallery, though. It was what was shown at the very bottom of the map: a chunk of land that looked very much like Antarctica. This was surprising since Antarctica had not been discovered until 1820. Even more intriguing was a section of the coastline of this southern continent. Part of it looked very much like the coast of Queen Maud Land which was a section of Antarctica. The strange thing was that the coast of Queen Maud Land had been covered with a thick sheet of ice for many centuries and its shape was only known now to modern mapmakers through the use of modern seismographic equipment. This made Mallory wonder if the Admiral had somehow owned maps that dated back before the ice sheet covered the coast and if the coast had been somehow surveyed from the air. Most serious professional geographers, though, rejected Mallery's radical theory without even considering it carefully. Professor Charles H. Hapgood, of Keene State College at the University of New Hampshire, did take an interest in the map and Mallory's thoughts. Professor Hapgood was known for his support of unorthodox theories. With the help of some of his students, Hapgood did a careful examination of Piri's map and several other old maps and published a book on the subject called Maps of the Ancient Sea Kings. The book suggests that at one time in the ancient past there was a world-wide civilization with advanced technology. Though this civilization was destroyed, some of its knowledge survived to wind up in the maps. Later, an even more radical theory for Piri's map was advanced from writer Eric Von Daniken. Von Daniken, a supporter of the idea that aliens had visited Earth in the distant past, noted that the map resembled what might be seen from space if you took a picture of Earth from directly over Cairo, Egypt. He suggested that the map was the result of aerial photographs taken from an alien spaceship. Critics of Hapgood and Von Daniken offer a more mundane explanation for the map. They start by pointing out that lots of maps from that era displayed a continent at the bottom of the Earth, though none had yet been found. There was a general belief going back to the time of the Greeks that all the continents must have been connected at one time. This lead to the belief in a southern continent (Interestingly enough, they were correct. The modern theory of plate tectonics supports the idea of single land mass in the very distant past). The critics point out that the land mass shown on the map may have a similar coastline to that of Queen Maud Land, but the similarity is not unmistakable. What is on Piri's map, they argue, is just a lucky attempt to display an unknown, but suspected land. The similarity, say critics, is just coincidence. They also point out that the map shows South America and Antarctica connected, which they have not been for many millions of years. Also information about weather conditions and animal life in Antarctica as found on the map is completely wrong. Other experts speculate that though the first recorded sighting of land in the Antarctica was in 1820, there may have been earlier unreported voyages to the southern reaches. Though this might not explain the coastline of Queen Maud Land on the Piri map, it might be the reason that there was such a strong belief in the existence of a southern continent. An ancient map that King Henry owned in 1500 A.D. clearly shows Atlantis. Greek documents and maps showing Atlantis that Christopher Columbus studied before he set sail for America, including the 1482 Benincasa Map showing 3 Atlantis islands that no longer exist! Explorers using a miniature submarine to probe the sea floor off the coast of Cuba said on Thursday they had confirmed the discovery of stone structures deep below the ocean surface that may have been built by an unknown human civilization thousands of years ago. Researchers with a Canadian exploration company said they filmed over the summer ruins of a possible submerged ``lost city'' off the Guanahacabibes Peninsula on the Caribbean island's western tip. The researchers cautioned that they did not fully understand the nature of their find and planned to return in January for further analysis, the expedition leader said on Thursday. how did the 2nd map clearly show atlantis? it only shows greenland, north and south america, europe, and africa, those were the only continents listed, so where does it say where atlantis is? . how did the 2st map clearly show atlantis? it only shows greenland, north and south america, europe, and africa, those were the only continents listed, so where does it say where atlantis is? . how did the 1st map clearly show atlantis? it only shows greenland, north and south america, europe, and africa, those were the only continents listed, so where does it say where atlantis is? Charles Berkey, 18/08: How did Chicago and Mexico City get on such an ancient map? Well. 1 thing. This clearly isn't the original map, and they probably drew cities on there just to show where they'd be compared to today. New York and New Orleans is also on there. I think we should be much more informed about the islam.They had done many thinks like the map of piri reis and they proved that their religioun let them rise . Atlantis artifacts are under the sphinx in the "hall of records" not to mention a host of other information. The Ark of Convent is said to be under there too!! Oh, and information of the Andromeda Galaxy. Theres a reason why its approaching and not receding from our own Galaxy! Exactly! And according to Edgar Cayce, after building the Sphinx, the remaining Atlanteans who aided the Egyptians, wrote of all their knowledge and history and sort them in archives under the sphinx. But this room hasn't been discovered yet. Apparently there IS a room, but they can't get to it. if anyone wants to see an island of ancient atlantis on a map.look at the piri reis map above.the islands in red located in between south america and africa are the fragments of atlantis. Atlantis stretched from north carolina to spain and down near the yucatan, it sunk because of three major cataclysms those islands were all that was left at that time everything else sank in the atlantic. Atlantis is in the atlantic ocean.the reason why its hard to find is because is covered in thousands of years of crap! Anyone who tries to look for it with out finding a map of it first, is wasting thier time. find the hall of records before they look for it that way there is already proof of it's existence and hopefully there are directions one can follow to atlantis, go to its location, wait for an under water storm that blows off the crap and get some findings. If your aren't going to be serious, don't wite other people's comments. This site is for people who comment on the text. Not on other's comments. Anyone heard of the Baghdad Battery? We could be looking at an artefact from the lost city. There is a copper cylinder inside a clay jar, and with other materials and Electrolyte (like the juice from lemons)it would create a charge. Plato himself mentioned the Atlanteans using orichalcum. So far all we know is that it is a special type of copper. Bingo! Maybe charged copper IS orichalcum! It was mentioned that the battery was an invention of one of the earliest civilsations. Could it be Atlantis? How did Chicago and Mexico City get on such an ancient map? I don't see anything on these maps. How do they "clearly" show Atlantis? You don't exactly do the best job pointing it out.